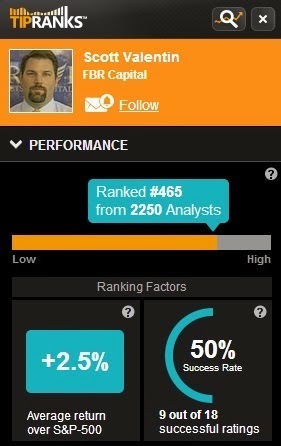 According to TipRank's website, 86.5 percent of analysts ratings are "BUY," but they are wrong 50.2 percent of the time. Each day, we are bombarded with recommendations by analysts and it's impossible to sort through the information without the help from a computer. It's a common psychological mistake to follow "hot" analysts that currently have made good recommendations. For example, after the financial crisis of 2008, it was common to see interviews with an analyst called Peter Schiff, who had "predicted" the financial crisis. But when the stock market moved up again, Peter Schiff, who was still negative to the stock market, disappeared from the television screens and was replaced with someone who had "predicted" that stocks would move up again. With TipRanks, we can clearly see if the current "hot" analyst is worth listening to, or if he/she has shouted "sell" the last 20 years. Should we really listen to analysts? Or is it a better idea to listen to our own knowledge. The famous find manager, Peter Lynch, always said that amateur investors can outperform Wall Street analysts by using their own knowledge. If you work at Tesla Motors, then you know more about the company than the analysts who lives 4133 km away in New York. Customers to the company where the analyst is working tend to get the recommendations by the analyst before the recommendations become public. As some analysts move the stock market, it might be too late to listen to the analyst when the recommendation is public. The strategy to buy/sell before the recommendation becomes public was used by the fund manager Michael Steinhardt. Good amateur investors are publishing their recommendations on blogs and TipRanks is not analyzing these recommendations. Maybe they will in the future?